It’s easy for us, as television viewers, to become blasé about nature documentaries. After all, we’ve been spoiled by the incredible work of pioneers such as David Attenborough for years now. We take slow motion images of cheetahs in full flight, or elephants at play, for granted. In this field, the quality of what has gone before is so great that it takes something truly exceptional to stand out. 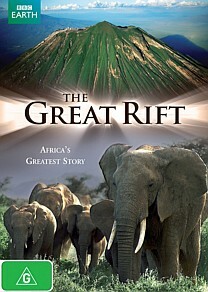 The Great Rift, a three-part documentary from BBC Earth, tells the story of Africa’s Rift valley and its inhabitants. Each of the episodes is centred around a vital element: ‘Fire’ shows us how the land was formed, and continues to be shaped, by volcanic activity on a mammoth scale. In ’Water’ we traverse the rivers and lakes of the region, from Victoria falls in the south to the huge lake Malawi and the very edge of Africa as it plunges into the Red Sea. ’Grass’ takes us on a journey from forests to plains, and describes the battle being waged between grass and trees for dominance in this part of the world. If a nature documentary like ‘The Great Rift’ fails to capture your imagination through the visuals, then it has failed as a whole. Thankfully the images are breathtaking, having been captured in HD. The bird’s eye and worm’s eye view have both been used to great effect here; you’ll fly around the impossible peak of Mt Kenya and be awed, and you’ll be right in the middle of a noisy troupe of baboons as they bed down for the night. As well as the familiar characters such as giraffes, hippos and lions, we are introduced to some of the less well known creatures and their habitats: Boiling acidic lakes in which fish play a life-or-death game to attain food, the saturated mountain homes of gorillas, and a deep ocean trench full of exotic life, are some of the highlights. Even if you’re an avid viewer of wildlife documentaries, chances are you’ll learn a lot from this series. Interestingly, it’s not all about the animals; the local people, such as Maasai farmers, also form part of the picture. There are some inevitable themes of conservation, but these aren’t as overbearing as they are in some documentaries. The human population is presented as part of the web of life, not as an external threat to it, which makes a refreshing change. The musical soundtrack to the Great Rift is at various times awe-inspiring and charming, without being too imposing. The narration by Hugh Quarshie is functional, but it fails to inspire you as much as what’s happening on screen. I found myself looking forward to the shots without narration, when the images were allowed to speak for themselves. While there aren’t any special features to talk about, each episode is followed up by a mini-documentary called ‘Inside the Rift,’ which follows the camera crew as they search for the perfect shot. It’s a great change of pace from the main feature, and gives you a depth of understanding that you otherwise wouldn’t have. Watching the crew try to climb a tree at night, without waking the chimpanzees that they are attempting at capture on film, is just as fascinating as the final product.